Digital scale is a modern way of weighing. Digital scale shows the most accurate weighing result in a LCD screen. This kind of scales operates via internal strain gage to represent accurate measurements. A strain gage is a piece of foil which is applied on a flexible surface. This surface is used to conduct electricity. A wide variety of mechanisms can be used distribute an object’s weight. When the weight bends the flexible surface where the strain gage is attached and deforms the piece of foil the electrical current is changed. The analog to digital converter passes the altered electrical current reading on to the microchip, and the microchip performs the mass or weight calculations which are transmitted to the LCD screen. The LCD screen shows the results in the expression which is clear to the user, for example: g, kg, t, lb, kN. 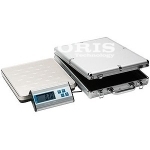 In this section you can find all the most popular digital scales which are used all over the World.